A world apart from the booming Destin golf scene and the condos of Fort Walton Beach, Shalimar Pointe Country Club is an old-school bargain in Gulf Coast Florida golf. A deep waste area provide the nickname for Shalimar Pointe's challenging "Grand Canyon" hole. SHALIMAR, Fla. - Shalimar Pointe Country Club sits on the western side of Choctawatchee Bay, just over the bridge from Fort Walton Beach and far from the shadows of the looming waterfront condos. The location is a reminder of its distance, geographically and temporally, from the new courses and big-name architects that are raising the profile of Destin-area golf. Still, while Destin golf booms, Shalimar Pointe, opened in 1968, remains one of the area's most popular clubs, even as it has changed owners, physical characteristics and even names (it used to be Lake Lorraine Country Club). "Actually, this is one of the oldest courses in the area," Head Professional Jason Woodling said. 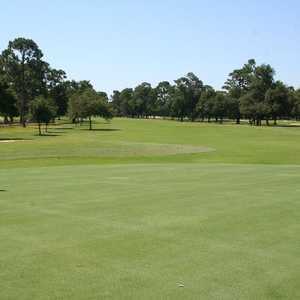 "This and the Eagle course out at Eglin [Air Force Base] are the two best in the area, design-wise." 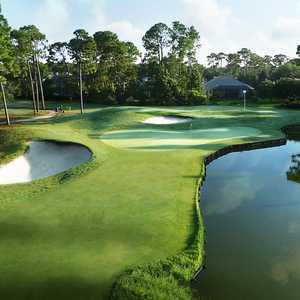 The course's current configuration comes largely from a 1986 redesign by the firm of Joe Finger, Baxter Spann and Ken Dye (no relation to the famous Dye family of golf course-architects). "The owners at that time, [their] thought was to try and free up some land in the middle of the property for development," Spann said. "We basically positioned the fairways closer to the perimeters of the outer property limits, so all the holes really shifted. I don't think there's anything left of that original Lake Lorraine routing." Give the trio credit: Shalimar Pointe's routing has a natural flow, despite the course essentially being torn apart to accommodate development. The track isn't too long at 6,765 yards, but it can play longer, as there are several holes that nudge you and whisper, "Hey, leave the driver in the bag." "Everybody says if you're looking for a challenge, come play us," Woodling said. "We're probably the toughest challenge around." That's a bit strong, especially since the course sports a genial slope rating of 129, but Shalimar is a very enjoyable play. The greens can be tricky, frequently falling off rather rudely into water, bunkers or deep collection areas. They are also sloped very nicely, with some multi-tiered. "You miss those greens, it's almost impossible to get up and down," Woodling said. No. 13 is a big, rollicking, fun par 5 with the green guarded by a huge waste area that gives the hole its nickname: "Grand Canyon." You have to get to a crest in the fairway to even see the big depression. The approach is downhill and over the canyon to a long narrow green with a false front and an odd front-to-back slope. Good luck if the pin is in front. The par-3 11th is another son of a gun, running 148 yards downhill to a bulkheaded green that sits sideways to the tee box and slopes sharply left toward water. With the pin left, at the bottom, the green shrinks to almost nothing. Getting a birdie here takes either unbelievable skill or blind luck. The par-4 17th is another doozy: If you can't turn the dogleg left and get a good roll, you're facing a 200-yard downhill approach over water to a dicey green. I disagree with Woodling's assessment of the Shalimar Pointe's difficulty, but it is an excellent course with memorable holes, some of them indeed challenging. Golf Week called it one of the "Southeast's top 50 development courses." The track runs through the Shalimar community, and pretty much every hole is house-lined. The day I played it was rainy and misty, so unfortunately I didn't get the views of the bay. Green fees are in the $50 range, including cart, and for that price, this is an excellent bargain. 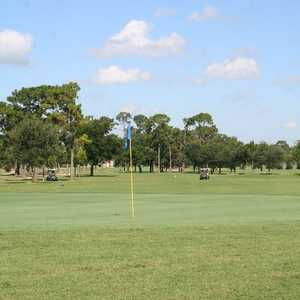 The Water's Edge condos on Okaloosa Island put you in a great spot to play the courses of Destin and Fort Walton Beach. The building is right on the gulf sand, with fine views of the water. The units are well-furnished, and the complex has two large swimming pools so close to the beach you can hear the waves lapping. It's also close to a variety of restaurants and non-golf activities. Then there's the parking garage. I never thought I'd write something like this, but the garage is one of Water's Edge's best features. It goes up four levels and you can practically park in front of your gulf-front condo. No more dragging your baggage up the elevator.